It's been a fun experiment but I'm glad this is the end of #0s. Aquaman #0. I can sum it up thusly: Swim swim swim. Look out - a shark! Talk talk talk. Exposition, exposition. Off to find Atlantis. Found it! Right away! The end. Okay, there's a bit more to it. 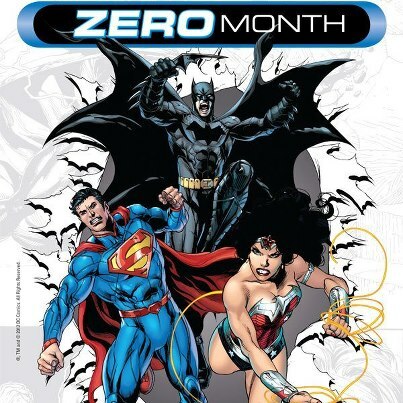 6 years ago Superman, Batman and Wonder Woman are specifically cited as existing (I thought Batman was just an "urban myth"?) but young Arthur Curry watches his daddy die after being attacked by pirate Black Manta. Everyone already knows he's half Atlantean, so he's chased into the ocean. Where, pretty art aside, Geoff Johns wastes like five pages of Arthur just swimming and then fighting and telepathically talking to a great white shark. Aquaman saves some people from a storm, they tell him they heard of another Atlantean in Norway, he goes to Norway and meets Vulko. There's a lot of blah blah blahing about Arthur's mother Atlanna, who is dead, and his half brother Orm, who killed her. Vulko gives Arthur a treasure map and some jewels and then they go off to find Atlantis. And they do. The end. Batman: The Dark Knight #0. The secret origin of Joe Chill! Well, not really. Filling in some blanks spots from Batman's origin story, it deals with young Bruce Wayne hero worshiping his dead father and obsessed with the idea that they must have been killed to fulfill some nefarious purpose. He hunts for answers until he's 18, looking for the sinister reason his parents were murdered, until he finds the gunman in that alley, Joe Chill. And Bruce find out there was no conspiracy, no greater purpose to the Waynes' murder. Joe Chill was a pathetic drunk who happened upon the Waynes by chance in Crime Alley and wanted Martha Wayne's pearl necklace. That's it. Disappointing for Bruce, slightly less so for the reader. But you know, it's still better than the old continuity where Joe Chill helped Batman fight The Reaper in Batman Year Two. That was terrible. Still, I prefer Batman Begins as Batman's definitive origin. Batman Incorporated #0. The only things here of real interest was a bit about the board room meeting where Bruce Wayne introduced the concept of funding Batman Inc. to the Wayne Enterprises board members (sold as "Wayne private security worldwide") and a comment at the end where Batman tells Alfred he's never seen him eat. Other than that, it's a Grant Morrison-y, dizzying worldwide romp meeting all the weirdo characters Morrison is so fond of that I couldn't care less about. Dark Ranger, El Gaucho, Knight and Squire, Wingman, whatever. I'm interested in the eventual showdown between Batman Inc. and Talia al Ghul's Leviathan. Superman #0. Scott Lobdell and Kenneth Rocafort, the creative team behind Red Hood and the Outlaws, take over Superman and deliver something really different. The most fun, entertaining, action packed depiction of Jor-El and Lara ever, as Jor-El discovers Krypton will explode, discovers Lara is pregnant, and the two of them get attacked by the Eradicator's Doomsday Cult out to implement Cosmicide. Jor-El is kind of like Reed Richards and Lara turns out to be an ex-military action heroine - it's a cool spin on Superman's parentage, and Rocafort eschews the cold white ice crystal world to turn Krypton into a colorful futuristic super world. One about to blow up, as there are strange bio-entities in its core facilitating its demise. Two extra big surprises: the story is narrated by Superman himself, who is somehow there on Krypton wearing his black suit, and there's some kind of monster at the end heralding the arrival of something called Oracle. (One presumes, not Barbara Gordon.) Superman has been such a drag all year, I'm surprised by how much I enjoyed this. As I said, it was just different and unexpectedly fun. The best issue of Superman since The New 52 started by far. Talon #0. The launch of the major new character spinning from the Court of Owls storyline in Batman. Talon's theme is escape. Calvin Rose is an escape artist who was treated cruelly as a child and escaped to Haly's Circus, where he was then recruited by the Court of Owls as is custom. We get to see some of the brutal ritual that goes into the Court training their Talons (I especially liked the creepy, bloodthirsty little kids in Owl masks watching the Talons), and soon, Calvin is ready to kill as the Talon. Wouldn't you know it, his first assignment and he freaks out, can't kill his targets. So now he's on the run. Five years later, still on the run (but remaining in Gotham? ), he is nearly killed by a new Talon, stuffed in a trunk of a car and thrown off a bridge. He escapes, of course, and upends the Talon. And Calvin Rose is back on the run. It's good, holding up to the standards of the twelve issues of the Batman Court of Owls story. Calvin Rose is kind of like Mr. Miracle, if Scott Free dressed up like an armored bird instead of that ridiculous red, green and yellow costume. Teen Titans #0. Narrated by Batman, this is the new origin of Tim Drake, boy wonder, future Olympic athlete, A+ student, natural detective, headstrong, independent, who made a project out of discovering who Batman is. Tim applies for the job of Robin but Batman tells him to get lost, all the while evaluating him with Alfred. So Tim decides to get Batman's attention by stealing the Penguin's fortune. (Does he give it back is the question.) To keep Tim's parents alive from Oswald Cobblepot's revenge, they are placed in federal protection. Meanwhile, Tim comes to live in Wayne Manor and chooses not to take on the late Jason Todd's mantle as Robin but instead becomes Red Robin. So there. Tim Drake was never Robin in The New 52. He was always Red Robin. Because he must love hamburgers that much. A lot of Batman this week. A lot. Too much. Two Batman titles plus Teen Titans is really Batman and Robin. And Talon is a Batman spin off. I'm surprised Batman didn't show up on Krypton too. Now that the zero issues are wrapped, I walk away from all these comics with one new addition to my pull list: Batwoman. I remember not really understanding Batwoman #1 when it came out a year ago, but Batwoman #0 was the only zero issue that got me so interested in a DC comic I wasn't reading that I went looking for what I'd missed out on. I'm glad I did because Batwoman is great. Other than that, nothing has changed. I still like the books I like and already read, I wasn't moved to add anything new besides Batwoman. The DC Universe seems healthy and vibrant a year after The New 52 launched and looking back to fill in some gaps in the new continuity seemed beneficial overall. It's a nice new DC Universe they're building. If they just fix Superman, they'll really be in business, but a new, improved Man of Steel might just be in the cards for 2013.